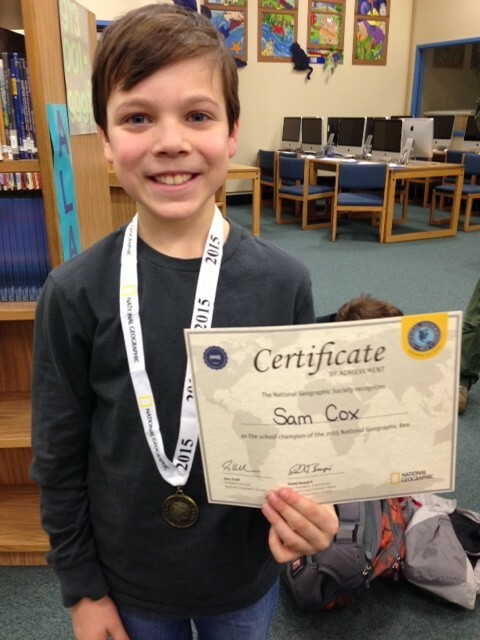 Today Sam won his school’s Geography Bee. For real! Some of you will remember when Sam was in second grade, how he so desperately wanted to enter a geography bee that he decided to invent one. If you care to hear the tale of our little boy and his enormous lie, you can read it here. But in a nutshell: he created geography bee contestants, daily questions, and even moderators. He fooled family members, friends, and possibly even himself. It’s a wonder we all survived that experience without therapy. Last year Sam was finally old enough to participate in the National Geographic Bee, but his school did not participate. He was crushed. I knew we needed some closure to this saga, so this year I volunteered to sponsor an after school geography bee club. I’m no cartographer, but we had fun playing games, making flashcards, and studying maps. The school’s kindergarten teacher volunteered to be the school’s official sponsor, so she downloaded the questions and coordinated the actual bee. Only seven kids signed up for the club, but they were all pretty darn brilliant and incredibly well traveled. At the first meeting I brought poster-sized copies of U.S. and world maps, and the kids marked all the places they had visited or lived. Later that night Sam asked why we had never been to Europe, as if it’s a perfectly normal travel destination for 5th grade Alaskan children. We only had eight study sessions before the school bee, and the kids were especially squirrely as we neared winter break. I sent them home with several study aides – online tools, book recommendations, and board games – to prepare for the school bee. Before we knew it, the big day arrived. Sam did so well in the early rounds I worried someone would think I had access to the questions – either as his club sponsor or at the school where I work. For the record: I would never compromise a contest like that. Not only would it be completely unethical and unfair to the other children, but it would be the ultimate vote of no confidence for my own child. The only thing worse than winning an imaginary bee would be cheating in a real one. Sam hates when we bring up his fictitious geography bee. “It was three years ago!” he declares. I want to roll my eyes, but then I remember that three years is nearly a third of his life. It seems like yesterday to me. He has grown and changed so much in these few short years, and we could not be prouder of our little map loving man. It was a tough competition, and all of the kids – Sam included – really struggled in the final rounds. He was truly humble when he accepted his championship medal and certificate. But amidst the buzz and flurry of emotions in the room, he and I shared a quick glance. We were the only ones there who knew the whole story: how his second grade fantasy had just become a fifth grade reality. It’s a pretty special thing to watch your child’s dream come true. Today it was just a little geography bee, but tomorrow…. well, that’s up to him to decide. I know his dreams will get bigger and farther away as he gets older, so today was special for me too. How often will I be right there… close enough to snap photos, call the grandmas, and squeeze him up in a most embarrassing hug? Well we need to plan a trip to Europe next summer!